This Security Policy has been established by PokerStars Live. Your participation in any Event constitutes consent to this policy. If you do not consent to this policy you should not take part in an Event. Criminal activity will not be tolerated during any Event and appropriate security measures will be taken to prevent such activity from taking place during the Event, and to immediately stop such activity from happening once detected. All applicable game rules, local house rules, and local and national gaming laws and regulations will be strictly enforced during all Events. Any person (s) found in breach of any of the foregoing, may forfeit the right to continue his or her participation in the Event and may be requested to immediately leave the premises. Any action or behavior that is seen or in our sole discretion thought to be abusive or threatening in any way, will not be tolerated and any person(s) committing such action may forfeit the right to continue his or her participation in the Event, and may be requested to leave the premises. Any person identified by us as being involved in or connected with any suspected unlawful activity may forfeit the right to continue his or her participation in the Event and may be requested to immediately leave the premises. PokerStars Live and the organising Casino reserve the right to take any other action against such person as it deems appropriate in their sole discretion, including, but not limited to, reporting such activity to law enforcement agencies. Any person identified by us as being involved in or connected with any suspected unlawful activity, or any person raising reasonable grounds for suspicion, may be barred from attending any Event sponsored by any company within the Amaya Group. PokerStars Live reserves the right to prevent, based on its sole discretion, any person( s) from attending any Event for security reasons, including, but not limited to, due to previous involvement in security incidents that give rise to reasonable grounds for suspicion. PokerStars Live shall employ a confidential reporting facility to ensure all security incidents are fully investigated. Any criminal evidence identified or collected during any investigation might be presented to law enforcement agencies for possible criminal prosecution. We want you to have a positive experience at PokerStars sponsored events and live rooms. As part of that, here is some advice to help you ensure that you maintain good personal security while attending. While every individual at a live event or live room is responsible for their own security, and that of all belongings in their possession, we want to provide some advice to help improve your personal security. To the fullest extent permitted by law, we assume no responsibility or liability to you for any damage or loss suffered by you while attending any PokerStars sponsored events unless such damage or loss is as a result of our negligence. When you travel to an event or live room, you are often in an unfamiliar environment, and may not speak the local language. Local thieves and criminals often target tourists attending large public events, and this can include players attending poker tournaments. Most crimes involving players at events are crimes of opportunity and the theft of personal belongings. Travellers can also be the targets of pick-pockets who operate where tourists tend to gather, especially in night-time entertainment venues. If you travel with personal computer equipment, be aware that this can be an attractive target for thieves; not just because the electronics have a great deal of intrinsic value, but also because attackers may want to hack into your various accounts (email, bank, online gaming, etc). Consequently, please read and follow the travel advice provided by your Government when travelling to foreign countries. Lock your computer screen when you step away. In the Windows operating system, just press the Windows Key and ‘L’ at the same time. On a Mac, press Cntl+Shift+Eject (Cntl+Shift+Power on Macs without an optical drive). Store your laptop in a safe and/or use a laptop security lock. Use full disk encryption. One free and open-source option is TrueCrypt. Follow advice on creating high quality passwords and use RSA Security Tokens to further improve the security of access to your Stars Account. Use high-quality anti-virus software, such as the options available from the PokerStars VIP Store. Keep your operating system up-to-date through regular patches available from the manufacturer of your operating system. High quality passwords, RSA tokens, and the like are useless if you give them to other people. If you wouldn’t hand somebody your ATM card and tell him its PIN, don’t give him access to your computer. Don’t write down passwords. Memorize them or use a password vault. If you absolutely must write them down, do so in some kind of code that will not be useful to fraudsters. If you believe your computer has been compromised, stop using it immediately and contact an expert as soon as possible. If you are at a live poker tournament, please notify hotel security. Assuming the computer is not needed by law enforcement officials, take it to a qualified computer security consultant and get it cleaned. And note that just changing your password(s) is not sufficient. There is a danger that somebody has installed a key-logger or other ‘malware’ on your device that will enable them to see the keystrokes you put in. Keep all your data backed-up regularly so that should you have to clean a computer, you will be able to recover your data. This will make it emotionally easier to do whatever is necessary to clean a compromised laptop. Keep the cost of a computer cleaning (or replacement) in perspective relative to the potential cost of somebody being able to access your Stars Account, or access your bank and credit accounts. The good news is that it’s likely you’ll never need these security measures. But just like wearing a seatbelt in your car, it’s better to be safe than sorry. Have a wonderful time at your next event and thank you for your continued support. We go to great lengths to ensure that games at PokerStars sponsored events, where PokerStars Live Game Integrity services are provided, are fair, and that everybody is playing on a level field. We routinely work with our venue partners and review events’ security procedures to continually improve in this area. Our first priority is to prevent rules violations through educating players. 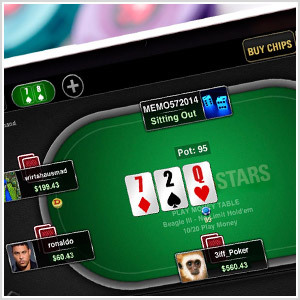 PokerStars Live welcomes many new players to the poker world, many of whom are unfamiliar with the rules of live poker. The vast majority of rules violations are caused by accident: they are non-malicious acts which are not deliberate, and cause little harm to other players. That’s why PokerStars Live educates players who accidentally and non-maliciously break the rules. Prevention - PokerStars Live engages live poker security experts to review, enhance and maintain a secure playing environment. This includes appropriate analysis of policies and procedures. Detection - PokerStars Live personnel are appropriately trained to report any suspicious activity to begin proper investigation and review. Enforcement - PokerStars Live reserves the right to apply any and all measures at its disposal against individuals who break the rules. This includes referring investigations to law enforcement officials as needed, and may lead to criminal prosecution. As part of this three-pronged strategy to reduce the risk of malicious activity at the events, PokerStars Live maintains a private list of players who are prohibited (to the extent permitted by law) from participating in events.